Nestled, almost hidden, within a scenic stretch of the West Creek Valley can be found a wooded island of green. Brooklyn Heights Park was established along the Seven Hills border some 60 years ago by the Village of Brooklyn Heights. Originally conceived as simply a unique and beautiful public park in the middle of a highly urbanized and residential landscape, for over half a century the park preserved and protected nearly one-mile of West Creek and its woodlands. But strategically positioned beside Interstate 480, the park now serves as a vital trail connection eventually linking up with Cleveland Metroparks West Creek Reservation and Watershed Stewardship Center, the historic Henninger House, and the Ohio & Erie Canal Towpath Trail, as well as the local neighborhoods, business areas, and points of interest along the evolving West Creek Greenway. Beginning in 2003, this role as a vital trail connection has been initiated and developed by West Creek Conservancy (WCC). Acting in partnership with the Village of Brooklyn Heights, WCC has been helping secure the grant funding necessary to slowly but steadily transform the vision of a West Creek Greenway trail connection into reality. In 2003, WCC purchased 27 acres of stream habitat adjacent to Brooklyn Heights Park with Clean Ohio Conservation Funds and matching funds from the Village of Brooklyn Heights. Upon purchase, WCC approximately doubled the size of the park by donating the land to the village and retaining a conservation easement on the entire property to ensure that it will be used for park and conservation purposes in perpetuity. In 2005, WCC helped the village receive $20,000 in federal grant money to perform environmental compliance and trail alignment work between Brooklyn Heights Park and the Ohio & Erie Towpath Trail. 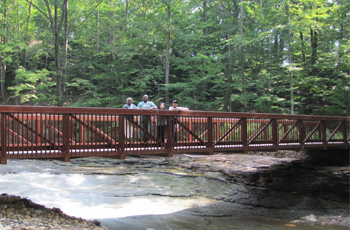 In 2006, WCC assisted the village in receiving $100,000 in grant money from the Ohio Department of Natural Resources to install a bridge over West Creek and build a trail within Brooklyn Heights Park. In 2010, WCC received a $103,000 Clean Ohio Trails Fund Grant and a Recreational Trails grant in the amount of $130,000 for land acquisition along the trail connecting Brooklyn Heights Park to the Henninger House. Justifiably proud of its beautiful natural park, Brooklyn Heights recognizes the importance of protecting West Creek and its much-needed floodplain by maintaining the vital streamside forest and riparian area as well as the surrounding stands of upland forest. Brooklyn Heights Park provides community residents with a unique opportunity to enjoy healthy and active lifestyles. WCC looks forward to continuing this partnership.